Body parts belonging to thousands of Indigenous Australians still languish in Australian and overseas (mainly British and European) archives – a shameful reminder of colonialism’s traumatic, generational legacy for Aboriginal and Torres Strait Islander people. Twenty years after Yagan’s head was reunited on country, far too little is being done to repatriate and respectfully keep Indigenous ancestral remains. Buzzfeed‘s Indigenous Affairs writer looks at why the date is not the point – it’s the day itself. The ANU journal Aboriginal History has posted an index to 40 years of work. Are Indigenous health programs delivering results? (Tim Carey in The Conversation.) Stan Grant on Pearls and Irritations (and the ABC) compares Australia’s tendency to leave its racist history in place with the American current preference to remove it. Prime Minister Turnbull, Opposition Leader Shorten, Q&A. Brief comment from Tony Smith on Pearls and Irritations. Amy McQuire in Buzzfeed notes the death of musician Dr G Yunupingu, activist Yami Lester, and Kuarna cultural leader, Stephen Goldsmith. Guardian Australia (Robin Denselow) obituary on Dr Yunupingu. Chris Graham in New Matilda discusses Indigenous deaths in custody and at the hands of settler Australians, including police. The poetry of Steven Oliver and the most recent film by Warwick Thornton. Paul Daley in Guardian Australia argues that the Recognise push has probably died and whitefeller politicians have to come to grips with a new possibility – an Indigenous voice to Parliament. The [Referendum] council’s recommendation was, ironically perhaps, the end result of a broad government-designed consultation that was conceived to streamline the desired outcome – yes or no to recognition and, if yes, well what should the amendment be? Instead the council consulted widely enough to demonstrate there could never be significant Indigenous support, let alone consensus, at the grass roots level for Recognise amid so many more priority questions. Colin Tatz in The Conversation (3 August) is sceptical – on the basis of the history of previous similar exercises – that White Australia will let the proposed voice to Parliament be effective. Sasha Grishin in the Canberra Times reviews the Albert Namatjira paintings now in the National Gallery of Australia in an exhibition entitled ‘Painting Country’. Meanwhile, Martin Edmond in Sydney Review of Books has a timely look at Rattling Spears: A History of Indigenous Australian Art by Ian W. McLean, published last year. This long review of a medium length book touches on Namatjira and many others. Links to MSM reports of this work, though the main report is behind a Nature paywall. Billy Griffiths in Inside Story (28 July). More in November. Myles Russell Cook writes about Percy Leason’s 1930s paintings, part of a new exhibition at the Ian Potter Centre, National Gallery of Victoria. God of our Dreaming. Father of all Aboriginal nations in Australia. You gave this land to our Aboriginal nations. You have not dispossessed us nor destroyed us. People from other lands, who do not understand our unique culture, our unique lifestyle and our unique heritage have come and destroyed much of our way of life. Today we are coming together again on one of our battlegrounds to cry out to You for mercy and justice for our children, for our families and for our land. We pray that more resources will be given to our local community organizations to help us grow healthy and strong. We pray that the peoples from other lands will be given a heart of flesh instead of a heart of stone so that they can understand us and support us properly. We pray that your Spirit will help and encourage us to grow good strong Aboriginal leaders. Please hear our cries for justice. We ask these mercies in the name of Your Son. Melissa Davey in Guardian Australia on Indigenous tour companies who want to make visitors understand how long Indigenous Australians have been here. Calla Wahlquist (Guardian Australia) reports on painstaking research on the Frontier Wars. (Other links added.) Followed up by David Stephens in Pearls and Irritations (republished in Crikey) and Paul Daley in Guardian Australia, both pointing out that the knowledge of massacres is not new but there has been an unwillingness among settler Australians to come to grips with it. Two articles from The Conversation to mark NAIDOC Week’s celebration of Indigenous languages: a Warlpiri story about the Dreaming (believed to be the first ever article written entirely in an Aboriginal language and published on a mainstream media outlet in Australia); Meera Atkinson on why non-Indigenous Australians should read Indigenous writers. Kim Mahood has written Position Doubtful: Mapping, Landscapes and Memories about her relationship with a family property in the Tanami Desert. (The property is now owned by the Warlpiri people.) The book is reviewed on the Whispering Gums blog (with a link to another review also). ‘In recent years’, says Mahood, ‘I have made a number of maps with Aboriginal people, designed to reveal common ground between white and Aboriginal ways of representing and understanding country’ but there is a lot more in the book than this. An extract in Inside Story from Paul Irish’s book, Hidden in Plain View: The Aboriginal People of Coastal Sydney, published by NewSouth. Together with Redfern, La Perouse become the urban Aboriginal face of coastal Sydney. The two places are linked by intermarriage and half a century of Aboriginal activism. They are also now linked to virtually every Aboriginal community across the country, and new arrivals are constantly being drawn along these threads of connection. We should celebrate this diversity, this survival, and we should be eager to hear the compelling stories they have brought with them, as well as the new chapters that they have added in Sydney. At the same time, we should be careful not to let their stories drown out the voices of those whose links to coastal Sydney extend back hundreds of generations, whose ancestors met the first Europeans, and who found a way to create an ongoing place for themselves in the oldest and largest city in the country. Theirs is a remarkable story of survival through cultural strength and cross-cultural entanglement that sits in stark contrast to commonly held views of colonial and Aboriginal Australia, and to the experiences of most Australians today. Article in the New York Times by John Eligon, plus complementary ABC Foreign Correspondent episode, following Eligon around Australia talking to Indigenous Australians. Melinda Hinkson writes in Guardian Australia that the Intervention has had deleterious outcomes. In the aftermath of the intervention there has been a profound shift in the terms of national attention to Indigenous affairs. If the intervention was an interregnum, a dramatic moment of flux and chaos between shifting policy paradigms, what is most strikingly displaced in its aftermath is any vision of Aboriginal communities as places that sustain distinctive, valued ways of life and where futures might be optimistically imagined and creatively pursued. Report in News Limited takes similar line, including interview with former NT Chief Minister, Clare Martin. Similar in The Conversation on 26 June from Diana Perche. Similar in The Conversation on 26 June from Graeme Maguire. Chris Graham in New Matilda updates his scoop from some years ago about how the Intervention came about. Michael Brull, also in New Matilda. CPA-ML comment. More from Jon Altman in New Matilda (28 July). Paul Daley in Guardian Australia writes about Chris Owen’s book, Every Mother’s Son is Guilty: Policing the Kimberley Frontier of Western Australia 1882-1905, and contrasts it with the stylised pioneering narratives of Mary Durack (Kings in Grass Castles). A repulsive image of dozens of Indigenous men in chains reminds us of our ugly past. Ambelin Kwaymullina in The Conversation reviews some picture books that present Indigenous stories. 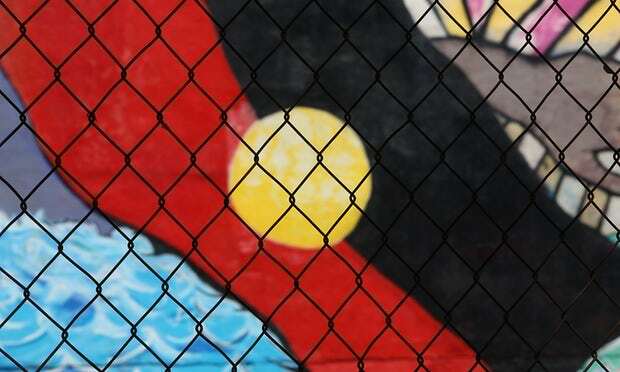 ABS statistics show imprisonment rates for Indigenous women are rising. ABC Awaye report on a documentary made by Warwick Thornton on the use and abuse of the Southern Cross. More in an ABC News story. The doco is called We don’t need a map and it makes clear that ‘the constellation is a site of power, reverence and secret knowledge’. The Conversation presents some statistics on progress in Indigenous education, with some series going back a decade or so. The picture is good only in scattered parts. First in a set of articles. Another article. The Conversation‘s Factcheck service finds that Noel Pearson’s assertion that Indigenous Australians are the most incarcerated people on earth is … spot on, based on the comparative data available. Paul Daley in Guardian Australia on an important anniversary. Teila Watson, also in Guardian Australia, about how Indigenous knowledge systems can advance our understanding of climate change. Australia is, says Watson, ‘[a] place so entrenched in the blood of colonialism that it has been unable to even consider listening to what First Nations people have been saying about care for country, even when it comes to making decisions that will affect our environment’. Daley compares the secret Admiralty instructions to James Cook, with their reference to ‘the Consent of the Natives’, with what actually happened after 1788. Presumably to mark the recent Indigenous round of AFL comes this map from the AFL Players’ Association, showing mob and locations for AFL Indigenous players. Finally though, I believe the need for governments to come to the table, rather than assuming Aboriginal and Torres Strait Islander people will happily assimilate into their visions of “Australia” without a framework for justice, was what the 1967 campaigners were driving toward. Their fight for recognition carried the hope that we would be seen not just as equals, but as people who have a distinct connection in this country, which needs to be properly respected. And to properly respect this, the government must consult, negotiate, make reparations and educate the public — so the atrocities of yesteryear are not doomed to repeat themselves time and time again. This is something mere recognition within a colonial document, written on the false basis of terra nullius, is never going to achieve. The prime minister was cautious, though, about possibilities for constitutional change. (Also Michelle Grattan.) Bill Shorten counselled an open mind as the appropriate response to the Uluru Statement. One of the more conservative – as in stronger on the Coalition side of politics – ‘Recognise’ support groups, Uphold and Recognise, was supportive of what came out of Uluru while the official Recognise website seems not to have noticed. Lots of useful comment – and positivity – on ABC QandA. By 30 May, though, the Institute of Public Affairs and conservative Liberals were muttering. Gaynor Macdonald in The Conversation argues a treaty should be the next step. Chelsea Bond in The Conversation on the nature of Australian racism. Frank Brennan in Pearls and Irritations on taking time to get things right. Fairfax explainer is useful. Amy McQuire in Guardian Australia. Megan Davis in The Monthly in July. Michael Mansell in New Matilda in August says the Uluru statement does not go far enough. For some basic background on other treaties: the Treaty of Waitangi 1840 New Zealand; treaties with Indigenous peoples, Canada; developments in Victoria. More background to Uluru is here and here (with earlier material in 20 May post below) but the first report of the outcome is here, with rejection of constitutional recognition but a punt for treaty and a representative body with power. The Bringing Them Home anniversary is marked by this article about the Colebrook Home memorials, a report on progress or lack of it over 20 years (ABC report, too), and analysis in three articles in Indigenous X in Guardian Australia (one, two, three). Tim Bottoms matches Frontier Wars and massacres against the Genocide template. And a piece about the Indigenous angle on Australian Rules football – to mark the Indigenous round. Finally, Joanna Mendelssohn on the Defying Empire exhibition at the National Gallery of Australia. This brief round-up takes us back a long way but also forward. There is: an article giving the background to a potentially important conference at Uluru about constitutional recognition of Indigenous Australians; three reviews of three exhibitions about Indigenous military service (here, here, and here); reports in The Conversation and WA Today of an important archaelogical find in Western Australia; a 2014 ABC piece that we just found about a hypothesis that an outbreak of smallpox among Indigenous Australians near 1789 Sydney was not a chance event; and some research on exploration and Indigenous history in the Mudgee area. Rhiannon Shine writes for the ABC about a move by the Tasmanian Aboriginal Centre to ask state authorities to give palawa kani names to places in Tasmania whose English names commemorate massacres of Indigenous Australians or are in other ways offensive to Indigenous Tasmanians. Some of the proposed names would be the original, pre-invasion names restored.